I got a great opportunity to buy an Omega Seamaster Aqua Terra mens chronometer watch. This is a beautiful watch and a great “daily beater” as watch collectors like to call them. They are the modern day Seamasters that follow up the Omega tradition since the fifties or so. Without being true diver’s watches, they are totally waterproof for any diving I would ever dream of doing, and they feature a very reliable movement. Or are they, indeed reliable? The answer is yes, however not without a few remarks. Omega has suffered from a few childhood deceases in their quest to deliver the best mechanical movements on the planet. 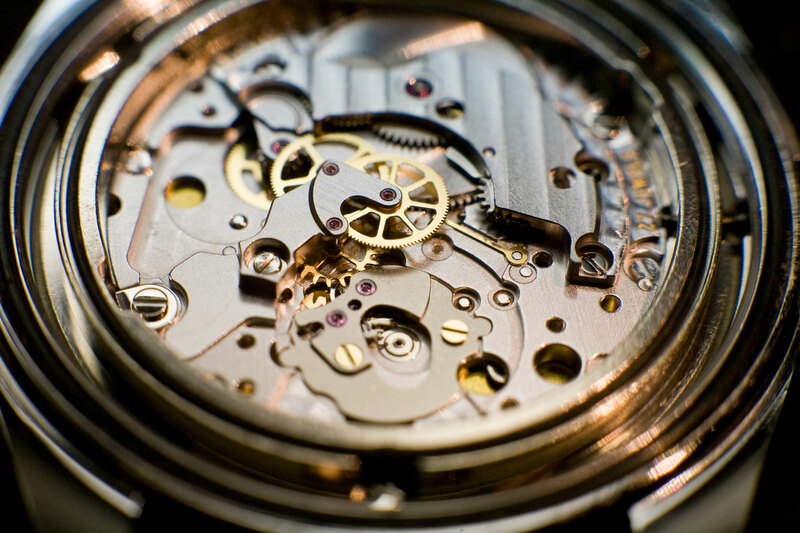 The Caliber 2500’s were the first movements to implement the co-axial escapement, and the early batches were prone to lose amplitude and occasionally stop. The movements were soon improved with version “B”, “C” and “D” as Omega worked out the difficulties. The first two versions “A” (or blank) and “B” had a rate of 28 000 a/h (4Hz), and the later “C” and “D” had a lower rate of 25 200 a/h (3.5Hz). In the service chart for the 2500 there is a note to change the Intermediate escape wheel on version “C”, as the gold coloured wheel in place could collect residues from the escapement (I guess) and cause the above mentioned symptoms. Now I can get back to my watch. There is as usual, no such thing as a free lunch, and my great opportunity came with a “but”; It doesn’t run like it should… It was keeping excellent time (+4 s/d) and running strong, but when setting the time and thus stopping the watch (because of the hack mechanism) it would be very hard to make it run again. I had bought it because I am curious about these movements and I would really like to have a look inside. Sure enough, this was my chance! I decided to open it and inspect the train of wheels and particularly the second intermediate whee. As the pictures show, this is a splendid looking movement, and it gets even better when the oscillating weight is removed. 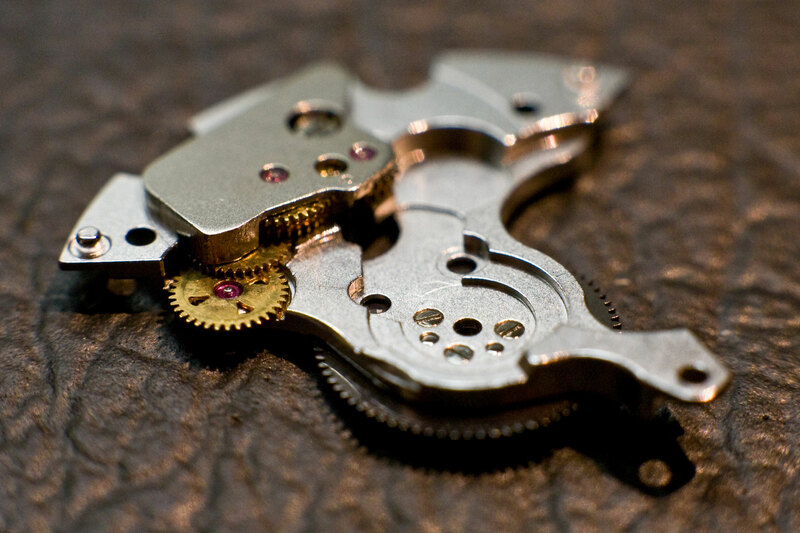 The self-winding mechanism is mounted in a separate section, just like in most automatic movements. However this is unusual as this section now digs a lot deeper into the movement. 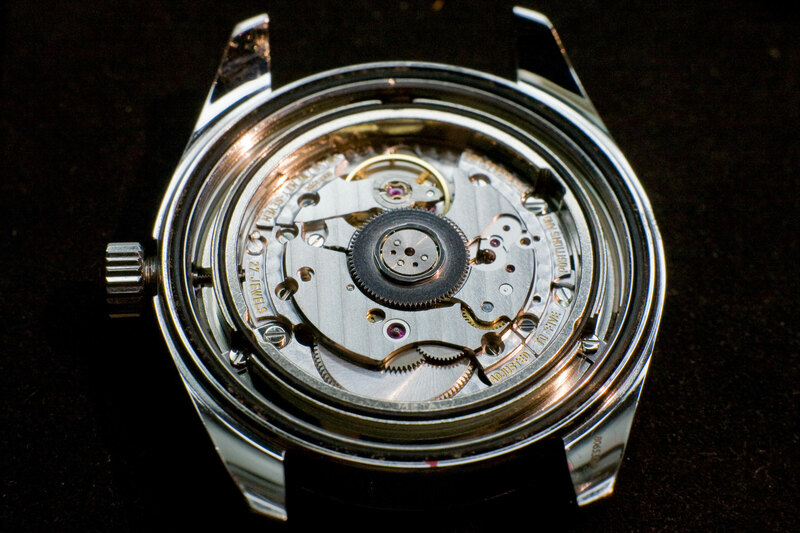 Normally, in most Omega and ETA movements the wheels in this part are spread out wide to cover a thin layer all over the top of the movement. Now we find the wheels neatly stacked in a corner and sunk in between the rest of the movement parts. It makes perfect sense and it looks elegant! I carefully removed the parts including the balance unit, and got my finest magnifier loupe to look for any irregularities. There were tiny spots of dust in there, but nothing to indicate trouble this movement is going through. I cleaned up the little I could see, and reassembled the watch, only to find a very odd thing; it is now running slower! I am down to -30 s/d but running just as steady. I don’t quite understand how this can be, so I need to read on and hopefully find the reason for this. Furthermore it was equally difficult to start it again after a halt. So now I am considering looking into the dial side of the watch. I can tell the movement has been removed from the case at one stage, and this might be due to a change of dial perhaps? If not done by an Omega service person, they might have left something just slightly out of order. The fact that it has trouble starting suggests to me that there is an obstacle somewhere. While running, it runs flawless so if my theory is right, there would be something permanently holding back the power.